Mariposa is on the main road to Yosemite National Park, and it's the gateway to some of the best four wheeling that the Sierra Nevada Mountains have to offer, and is a place that we've been visiting for many years, since nearby Merced is our home town. We've been enjoying the fine cuisine at Happy Burger Diner for many years, and I can recall many a "happy burger" enjoyed at the restaurant in the early 1970's, when the building housed a national burger chain. Fast forward the date to 1995, when the current owners acquired the restaurant, remodeled it, and turned it into what it is today - Mariposa's premire burger restaurant. 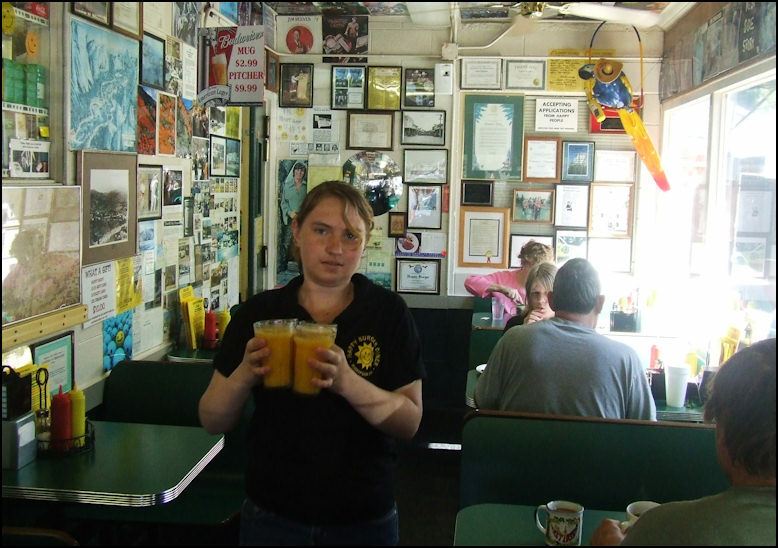 Photo: Located in scenic Mariposa, Happy Burger Diner claims to feature the largest menu in the Sierra. I can't confirm nor deny that claim, but what I do know is the menu is extensive, as I counted EIGHT pages, including drinks. It's around 6:30 in the evening on Wednesday, July 11, 2018, and after a 12+ mile hike in Yosemite National Park, we're hungry, and looking for a great burger. We've come to the right place. Photo: There is nothing fancy about Happy Burger Diner, as the food is delicious diner cuisine, and the decor is functional, and quite "funky." look at the upper walls and ceilings and you'll notice it's decorated with vintage album covers from vinyl records. The salad bar is to the right of the photo, as Greg and Michael wait in line to place their orders. Photo: I LOVE this... a high-tech "Touch Tunes" juke box, customized for this fine diner. I doubt that it will win the "Wurlitzer Prize," but it's a modern-day juke box, seldom see in the year 2018. Photo: One page from the extensive menu, which featured sandwiches and burgers - which is the specialty of this fine restaurant - and in my humble opinion, is the showcase page of the menu. The menu features ANOTHER page of hot and cold sandwiches, which includes something for every taste. There are even "vegan" options. Three of us zeroed in on the "Guacamole Burger," while Greg ordered the "Guacamole Chicken Sandwich," as he's a huge fan of chicken. If you're not interested in a burger or a sandwich, just turn the page and you'll discover Mexican selections, dinners, salads and much more. Photo: The format at Happy Burger Diner is that you make your selection from the printed menu, place your order at the counter, pay for it, and when your order is ready, it will be brought to your table by one of the charming staff. The staff will take down your name and if they don't remember who you are - they have an uncanny memory of who everybody is - they will call your name, and your order will be brought to you with a smile. I'm in line behind Michael and Greg, as they place their dinner orders. Note the two staff members are writing down the orders, in an "old school" fashion, as this fine restaurant is definitely and "old school" diner. You can catch a glimpse of the kitchen over the shoulder of the friendly staff member wearing the red bandana. Photo: Michael takes a dip into the salad bar, as he chose salad as his "side," rather than fries like the rest of do. Photo shows a good look at the dining room, including the television monitors, and the vinyl record album covers, pasted to the upper walls and the ceiling. You also get an idea of what the main dining room looks like, but if you don't like the "diner-like" atmosphere, there are two other dining rooms for you to enjoy. 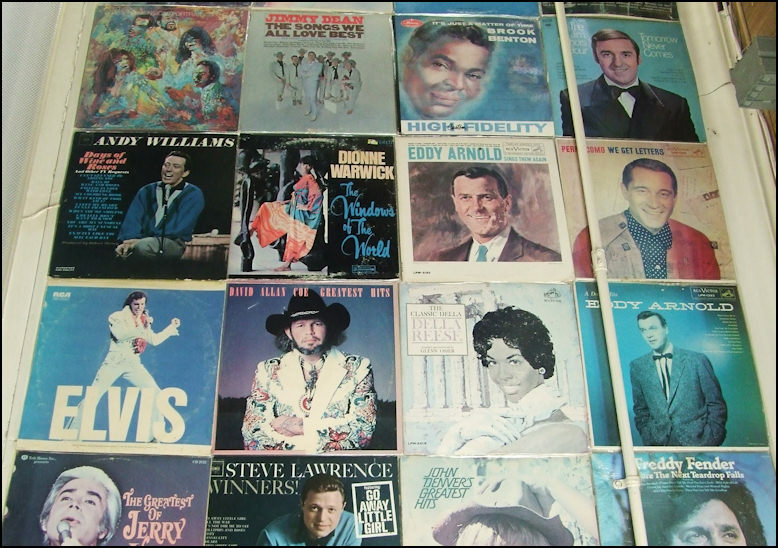 Photo: I looked up from our table, and this was my view of album covers, of vintage records. The entire ceiling of the restaurant is decorated with album covers, and I guess they'll never have to paint the ceiling. 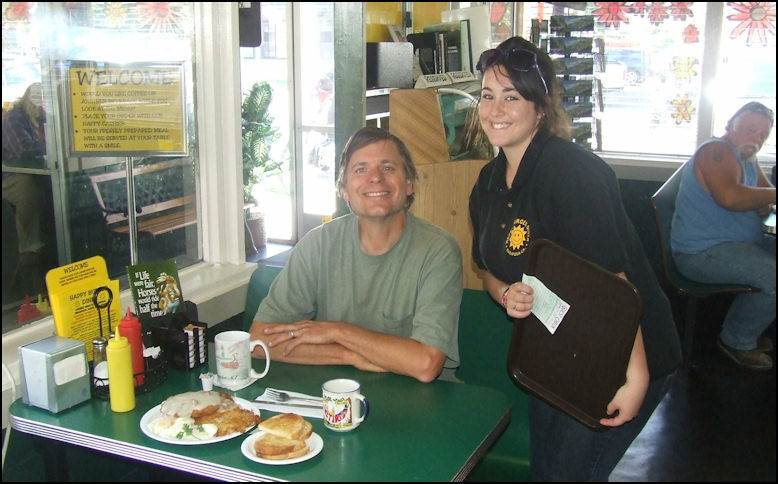 Photo: Greg's order came out first, delivered by our friendly server Leann. Greg's order was a "Guacamole Chicken Sandwich," which featured a grilled chicken breast followed by bacon, cheese, guacamole an Ortega chile pepper, pickle slice, and an order of fries. This sandwich is a chicken lover's dream! Photo: Michael, Margi and I ordered identically - "Guacamole Burger - and fries. Margi demonstrates the proper method to enjoy a fry, as she savors the burger on the plate in front of her as she's about to enjoy. Photo: Our friendly server, Leann, brings my "Guacamole Burger" and fries to our table with a smile. She actually brought out everybody else's orders first - mine arrived a couple minutes later - and I was unable to get her photo, but when she bought out my burger, I was able to photo her friendly smile. Thanks! I left a tip in the "tip jar" by the window with your name on it. Photo: Thanks to our friendly server, Leann, for taking the photo, as we prepare to enjoy our fine dinner. Left to right, me... your web master, photographer and producer, Eric, Greg, Michael and Margi. After a long day of hiking a trail in Yosemite National Park, burgers certainly taste good. Photo: Close-up of the best bacon guacamole burger, my "Bacon Guacamole" burger, that the Sierra, and the Mother Lode has to offer, as enjoyed at Happy Burger Diner, in Mariposa. "Bacon Guacamole" burger starts with a perfectly cooked - to your taste - beef patty, sandwiched between a large, fresh bun. Note the bun wasn't "soggy," as happens in many restaurants. The burger is dressed with jalapeno sauce - a "secret" recipe I suppose - bacon, Ortega chile, guacamole, grilled onion and Swiss cheese. No mustard, ketchup or anything else is needed, as this burger is flavorful, delicious, and is every way the burger that you've been dreaming about. Photo: I cut my amazing burger in half, not only to show the goodness for the photo, but to actually eat it with one hand. I could take a bite of my burger, set it down on the plate, enjoy a fry or two - or maybe four - and take another bite of a burger. What an enjoyable dinner after a long day of hiking in Yosemite! Photo: Happy Burger Diner is located at the east end of historic Mariposa, county seat of Mariposa County. Photo: Monday, June 16, 2016, on the way home from a day trip to Yosemite National Park, we stopped at Happy Burger Diner for a late - 8 o'clock in the evening - dinner. The restaurant was in full-swing, the salad bar was up and running, and the restaurant was packed with customers. Despite the sign at the order window that advised a 30 - 40 minute wait time for orders to arrive, our orders arrived in about 20 minutes. Since our last visit, back in 2009 - the original article follows - the decor hasn't changed, as it still features lots of funky record album covers of everything vinyl. We did note that the salad bar has received a facelift, but the ingredients seem to be the same. The menu states, "Mariposa's landmark nostalgic American diner. Featuring the Food You Love and "Mother Lode" portions..." I agree, as the food is delicious, the portions are ample, and the prices are reasonable. Photo: The "Guacamole Chicken Burger," complete with an order of fries. It includes a breast fillet, onion, Swiss cheese, Ortega chili pepper, bacon, and, of course, guacamole. The de-facto standard side with every burger or sandwich is fries, but you can have a single trip to the salad bar, if you prefer, rather than fries, for no extra charge. Curly fries, sweet potato fries, "tator" tots, fried zuchinni or onion rings can be added, for an additional charge. Note the fries still retain the potato skin, which is what I crave! As a lover of fries, I can vouch they're excellent! Photo: The first burger on the menu is the "Happy Burger," with an order of fries, that put a smile on the face of anybody who craves the best fries the Mother Lode has to offer. "Happy Burger" is the signature burger of Happy Burger Diner, and it is definitely an "old school" burger, which fits in, as the restaurant is definitely an "old school" diner. Garnishes include a 1/3 pound burger patty, cooked medium unless you tell them otherwise, your choice of several varities of cheese - American, Swiss, Cheddar, jalapeno jack, provolone, bleu, nacho or Cheddar cheese sauce - thousand island dressing, tomato, pickle and onion. This is truly a delicious burger! Photo: Double your delicious taste experience by ordering an extra patty of meat, for only $1.00 extra, and you get a "Double Happy Burger!" This was my dinner, and for cheese, I ordered the jalapeno jack. Not shown are my fries, and the pitcher of beer, but this dinner was FANTASTIC, and with the 10% senior discount offered to patrons 55 years or better, the total price of my meal came to $13.00 plus some change. I shared the pitcher of beer with my brother-in-law Greg. The photo of this burger looks amazing, but it tasted even better than it looks in the photo. Photo: On this Monday evening, the dining room at Happy Burger Diner is a busy place. My brother, Michael, is in the center of the photo, and just to his right, is my brother in law, Greg, as he's getting up from the table. Note the covers from vinyl record albums which decorate the walls and the ceiling of the restaurant. We'd just completed a 11+ mile day hike in Yosemite National Park, and we stopped at Happy Burger Diner, as we know it's THE place in Mariposa County to enjoy a superior burger! 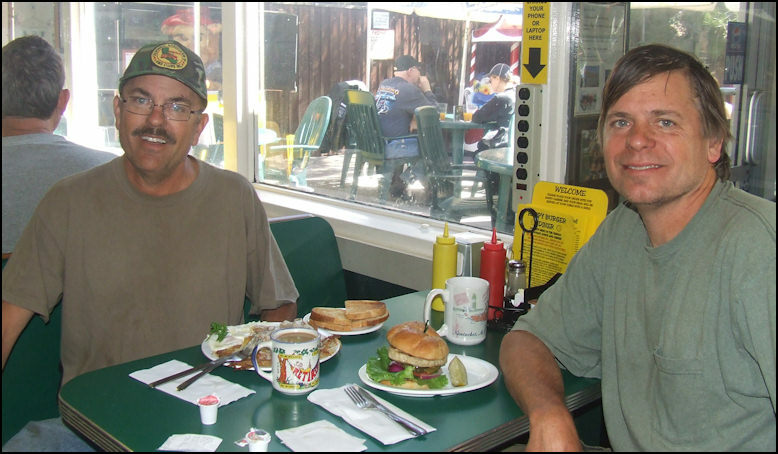 Although Happy Burger derives two-thirds of it's name from burgers, the restaurant doesn't limit themselves to burgers, as their menu is advertised as "Largest Menu in the Sierra!" That is no idle claim, as the menu is huge, and it's one of the largest menus that I've ever seen. The menu features two pages of breakfast entrees, three pages of burgers and sandwiches, one page of nothing but fries, combos and side dishes, a page and a half of Mexican food, and a couple of pages of baked potatoes, meal deals, soups, salads, and beverages. Altogether, their menu is ten pages long! If you're a lover of locally crafted beer, you'll be pleased to note they offer Mariposa Beer on tap... it doesn't get any better than that! If you're simply a "regular" beer lover, the menu offers a full pitcher of Budweiser for only $9.99, which makes a great deal. 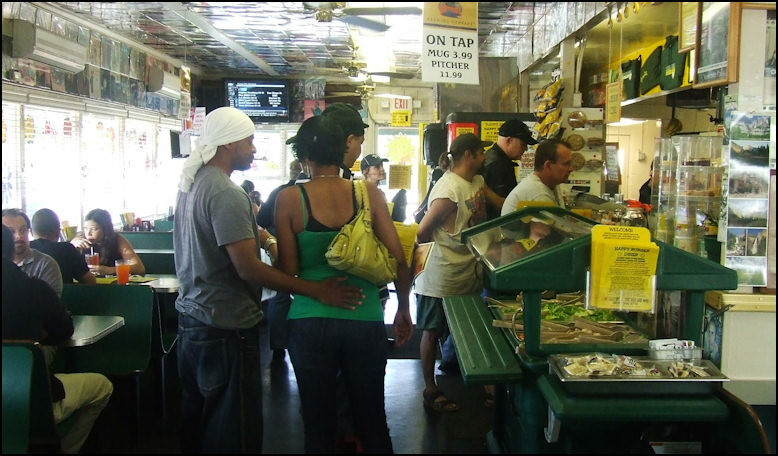 Photo: Memorial Day morning, 2009, finds the restaurant very busy, as these hungry diners wait to place their order. The salad bar is to the right of the photo. Gone is the sterile, corporate decor from years gone by, as the decor of the restaurant is about as funky as it comes, especially if you're a music fan. The walls above the windows and the ceiling are decorated with colorful 33 rpm vinyl record album covers of all genres. Actually, decorated is an understatement, as the walls and ceilings are completely covered with the album covers... there must be hundreds of them plastered everywhere... I've never seen anything like it before. Amenities include a salad bar, juke box, patio dining, children's play area, charging stations for notebook computers and cell phones, free wi-fi high speed Internet access, a dining area for doggies, and karaoke on the patio. If you're short of ready cash, they have a convenient ATM on-site. Mariposa Country High School Grizzlies booster items, such as tee shirts, polo shirts and hats are offered for sale, along with Happy Burger coffee cups and gift cards. Happy Burger Diner is quite an enterprising restaurant. 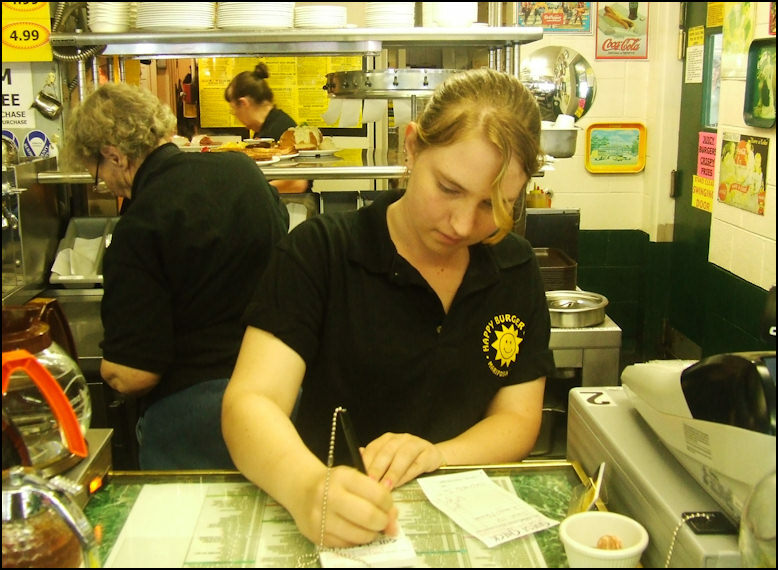 Photo: Courtney takes my order the old fashioned way, as the restaurant is very "low tech." Happy Burger Diner features a format that combines the best (and worst) attributes of a fast food, and a sit-down restaurant. You walk in, and you make your choice from one of the menu board, or you can grab one of the paper menus that are strategically placed around the dining room. The menu choice is almost bewildering, and you're easily distracted from the album covers... if you can get past all of that, you're sure to find something that you love, as their menu included everything. After making your choice, you place your order with the friendly cashier, pay for your meal, grab your receipt, and pick a table. When your meal is ready, it will be brought to your table on a tray. 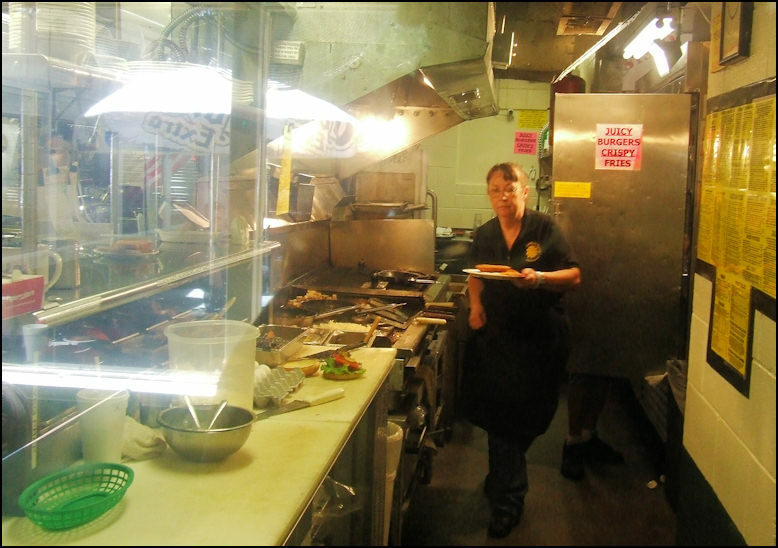 Photo: I was able to stick my camera lens in the busy kitchen and snap a photo before anybody realized what I was doing. Photo: Courtney brings orange juice. The photo gives you an idea of the funky dining room decor - very cluttered! Since it was Memorial Day, the restaurant was very busy, but the wait was quite short, and very pleasant, as it gave me an opportunity to check out the interesting decor, snap a few photos, and enjoy multiple cups of their delicious coffee. Happy Burger Diner seems to be a magnet for Yosemite-bound tourists, along with the motorcycle, motorhome and tour bus crowd, but the restaurant is a hangout for locals as well. If you happen to be actively serving in the military, employed in public service, an honor roll student, or you're 55 or older, you'll receive a 10% discount. It seemed like I'd just began to admire some of the album covers when I heard my name being called by Monica, one of the friendly waitresses, who brought our meals to the table. Photo: A few of the 33 rpm vinyl record album covers on the ceiling, directly above our table. We especially got a kick out of the Freddy Fender and David Allan Coe album covers, as we're fans of Country Music. So what is the food like? In a word, great... Michael commented that his chicken burger was great, and it looked and smelled great. My chicken fried steak arrived hot from the kitchen, covered with delicious gravy, with big chunks of sausage. I ordered eggs over easy, and they were cooked perfectly, and the order of hash brown potatoes on the side were crispy golden brown on the outside, and chewy on the inside, just the way I like them. An order of sourdough toast and a bottomless cup of some of the best coffee in the Sierras rounded out my breakfast. Photo: Shy Monica poses next to Michael, after placing my breakfast on the table. 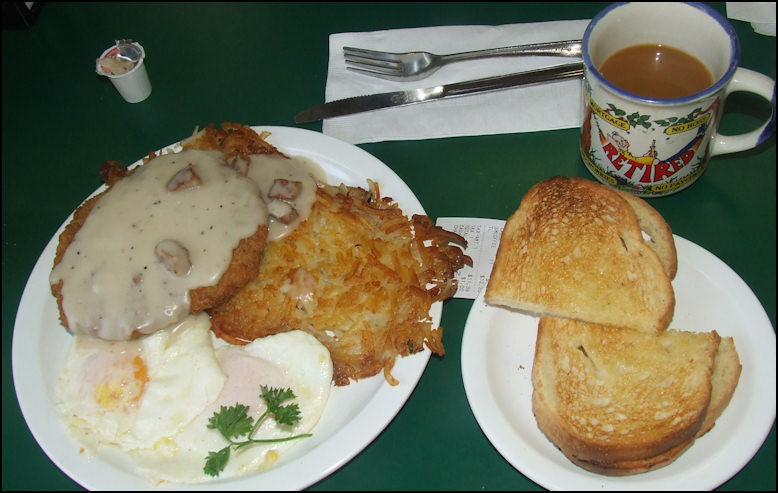 Photo: My delicious breakfast of chicken fried steak, eggs, hash brown potatoes, toast and coffee. Note the garnish of a sprig of parsley, which adds a nice touch to the plate of food. Photo: Monica snaps our photo, with your author and web master, Eric to the left, and brother Michael to the right of the photo. Note the outside patio dining, visible through the window. When you're on your way to Yosemite National Park, or visiting California's Gold Country, and you're in the mood for a great meal, and funky decor, make tracks to Happy Burger Diner. You'll be glad you did!